Alger Hiss (November 11, 1904 – November 15, 1996) was an American government official who was accused of being a Soviet spy in 1948 and convicted of perjury in connection with this charge in 1950. Before he was tried and convicted, he was involved in the establishment of the United Nations both as a U.S. State Department official and as a U.N. official. In later life he worked as a lecturer and author. On August 3, 1948, Whittaker Chambers, a former U.S. Communist Party member, testified under subpoena before the House Un-American Activities Committee (HUAC) that Hiss had secretly been a Communist while in federal service. Called before HUAC, Hiss categorically denied the charge. When Chambers repeated his claim on nationwide radio, Hiss filed a defamation lawsuit against him. During the pretrial discovery process, Chambers produced new evidence indicating that he and Hiss had been involved in espionage, which both men had previously denied under oath to HUAC. A federal grand jury indicted Hiss on two counts of perjury; Chambers admitted to the same offense but, as a cooperating government witness, was never charged. Although Hiss's indictment stemmed from the alleged espionage, he could not be tried for that crime because the statute of limitations had expired. After a mistrial due to a hung jury, Hiss was tried a second time. In January 1950, he was found guilty on both counts of perjury and received two concurrent five-year sentences, of which he eventually served three and a half years. Hiss maintained his innocence until his death. Arguments about the case and the validity of the verdict took center stage in broader debates about the Cold War, McCarthyism, and the extent of Soviet espionage in the United States. Since Hiss's conviction, statements by involved parties and newly exposed evidence have added to the dispute. Author Anthony Summers argued that since many relevant files continue to be unavailable, the Hiss controversy will continue to be debated. The 1995 Venona Papers prompted more support for the theory that he was a Soviet spy, but were not yet deemed conclusive by all sources. Alger Hiss was one of five children born in Baltimore, Maryland, to Mary "Minnie" Lavinia (née Hughes) and Charles Alger Hiss. Both parents came from substantial Baltimore families who could trace their roots to the middle of the eighteenth century. Hiss's paternal great-great grandfather had emigrated from Germany in 1729, married well, and changed his surname from "Hesse" to "Hiss". Minnie Hughes had attended teacher's college and was active in Baltimore society. Shortly after his marriage at age 24, Charles Hiss entered the business world and joined the dry goods importing firm Daniel Miller and Co. He did well, becoming an executive and stockholder. When Charles's brother John died suddenly at age 33, Charles assumed financial and emotional responsibility for his brother's widow and six children in addition to his own expanding family. Charles also helped his wife's favorite brother, Albert Hughes, find work at Daniel Miller. Hughes at first distinguished himself and was promoted to treasurer of the firm, but then he became involved in a complicated business deal and was unable to meet the financial obligation that was part of a joint agreement. As a matter of honor, Charles Hiss felt compelled to sell all his stocks to make good his brother-in-law's debts, as well as to resign from the firm. This was in 1907, the year of a great financial panic. After inconclusive attempts by relatives to find him a job, Charles fell into a serious depression and committed suicide, cutting his throat with a razor. Minnie, who had made the most of her former prosperity and social position, now had to rely on her inheritance and assistance from family members. Alger Hiss was two years old at the time of his father's death, and his brother Donald was two months old. As was customary in those days, they were not told of the circumstances of Charles Hiss's death. When Alger learned of it inadvertently years later from neighbors, he angrily confronted his older brother Bosely, who then told him the truth. Shocked, Hiss resolved to devote the rest of his life to restoring the family's "good name". Hiss learned to compartmentalize and to seek out paternal surrogates. At school he was popular and high performing. He attended high school at Baltimore City College and college at Johns Hopkins University, where he was voted "most popular student" by his classmates and graduated Phi Beta Kappa. In 1929, he received his law degree from Harvard Law School, where he was a protégé of Felix Frankfurter, the future U.S. Supreme Court justice. During his time at Harvard, the famous murder trial of anarchists Nicola Sacco and Bartolomeo Vanzetti transpired, which ended in their conviction and execution. Like Frankfurter, who wrote a book about the case, and like many prominent liberals of the day, Hiss maintained that Sacco and Vanzetti were convicted unjustly. In 1929, Hiss married Priscilla Fansler Hobson, a Bryn Mawr graduate and grade school teacher. Priscilla, previously married to Thayer Hobson, had a three-year-old son, Timothy. Hiss and Priscilla had known each other before her marriage to Hobson. Hiss served for a year as clerk to Supreme Court Justice Oliver Wendell Holmes, Jr., before joining Choate, Hall & Stewart, a Boston law firm, and later the New York law firm then known as Cotton, Franklin, Wright & Gordon. During the era of President Franklin Delano Roosevelt's New Deal, Hiss became a government attorney. In 1933, he served briefly at the Justice Department and then became a temporary assistant on the Senate's Nye Committee, investigating cost overruns and alleged profiteering by military contractors during World War I. During this period, Hiss was also a member of the liberal legal team headed by Jerome Frank that defended the Agricultural Adjustment Administration (AAA) against challenges to its legitimacy. Because of intense opposition from agribusiness in Arkansas, Frank and his left-wing assistants, who included future labor lawyer Lee Pressman, were fired in 1935 in what came to be known as "the purge of liberals." Hiss was not fired, but allegations that during this period he was connected with radicals on the Agriculture Department's legal team were to be the source of future controversy. In the meantime, Hiss also served initially as "investigator" and then "legal assistant" (counsel) to the Nye Committee from July 1934 to August 1935. He "badgered" DuPont officials and questioned and cross-examined Bernard Baruch on March 29, 1935. (In 1947, Baruch and Hiss both attended the burial of Nicholas Murray Butler. In 1988, he called Baruch "vain and overrated Polonius much given to trite pronouncements about the nation." In 1936, Alger Hiss and his younger brother Donald Hiss began working under Cordell Hull in the State Department. Alger was an assistant to Assistant Secretary of State Francis B. Sayre (son-in-law of Woodrow Wilson) and then special assistant to the director of the Office of Far Eastern Affairs. From 1939 to 1944 Hiss was an assistant to Stanley Hornbeck, a special adviser to Cordell Hull on Far Eastern affairs. In 1944, Hiss was named Director of the Office of Special Political Affairs, a policy-making entity devoted to planning for post-war international organizations. Hiss served as executive secretary of the Dumbarton Oaks Conference, which drew up plans for the future United Nations. In November 1944, Hull, who had led the United Nations project, retired as Secretary of State due to poor health and was succeeded by Undersecretary of State Edward Stettinius. President Harry S. Truman address 1st UN Conference in San Francisco (from left: unknown person, Truman, Harry Vaughan, Edward Stettinius, Hiss) on June 26, 1945. In February 1945, as a member of the U.S. delegation headed by Stettinius, Hiss attended the Yalta Conference, where the Big Three, Franklin D. Roosevelt, Joseph Stalin, and Winston Churchill, met to consolidate their alliance to forestall any possibility, now that the Soviets had entered German territory, that any of them might make a separate peace with the Nazi regime. Negotiations addressed the postwar division of Europe and configuration of its borders; reparations and de-Nazification; and the still unfinished plans, carried over from Dumbarton Oaks, for the United Nations. Before the conference took place Hiss participated in the meetings where the American draft of the "Declaration of Liberated Europe" was created. 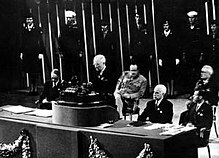 The Declaration concerned the political future of Eastern Europe and critics on the right later charged that it made damaging concessions to the Soviets. Hiss drafted a memorandum arguing against Stalin's proposal (made at Dumbarton Oaks) to give one vote to each of the sixteen Soviet republics in the U.N. General Assembly. Fearing isolation, Stalin hoped thus to counterbalance the votes of the many countries of the British Empire, who he anticipated would vote with Britain, and those of Latin America, who could be expected to vote in lockstep with the United States. In the final compromise offered by Roosevelt and Stettinius and accepted by Stalin, the Soviets obtained three votes: one each for the Soviet Union itself, the Ukrainian SSR, and the Belorussian SSR. Hiss was Secretary-General of the United Nations Conference on International Organization (the convention that created the UN Charter), which was held in San Francisco from 25 April 1945 to 26 June 1945. Allen Weinstein wrote that Andrei Gromyko, the Soviet delegate to the conference, praised Hiss to his superior Stettinus for his "impartiality and fairness". Hiss later became full Director of the State Department's Office of Special Political Affairs. In late 1946, Hiss left government service to become president of the Carnegie Endowment for International Peace, where he served until May 5, 1949, when he was forced to step down. On August 3, 1948, Whittaker Chambers, a former Communist Party member, appeared before the House Committee on Un-American Activities (HUAC) to denounce Alger Hiss. A senior editor at Time magazine, Chambers had written a scathingly satirical editorial critical of the Yalta agreements. Chambers asserted that he had known Hiss as a member of "an underground organization of the United States Communist Party" in the 1930s. The group, which Chambers called the "Ware Group," had been organized by agriculturalist Harold Ware, an American communist intent on organizing black and white tenant farmers in the American South against exploitation and debt peonage by the cotton industry (Ware had died in 1935). According to Chambers, "the purpose of this group at that time was not primarily espionage. Its original purpose was the Communist infiltration of the American government. But espionage was certainly one of its eventual objectives." As historian Tim Weiner points out, "This was a crucial point. Infiltration and invisible political influence were immoral, but arguably not illegal. Espionage was treason, traditionally punishable by death. The distinction was not lost on the cleverest member of HUAC, Congressman Richard Nixon.... He had been studying the FBI's files for five months, courtesy of J. Edgar Hoover. Nixon launched his political career in hot pursuit of Hiss and the alleged secret Communists of the New Deal." Rumors had circulated about Hiss since 1939, when Chambers, at the urging of anti-Stalinist Isaac Don Levine, had gone to Assistant Secretary of State Adolf A. Berle, Jr. and accused Hiss of having belonged to an underground communist cell at the Department of Agriculture. In 1942, Chambers repeated this allegation to the FBI. In 1945 two other sources appeared to implicate Hiss. In September 1945, Igor Gouzenko, a 26-year-old Ukrainian whose three-year tour as a cipher clerk stationed at the Soviet Embassy in Ottawa was coming to an end, defected from the Soviet Union and remained in Canada. In exchange for asylum, Gouzenko offered to Canadian authorities evidence about a Soviet espionage network actively working to acquire information about nuclear weapons, along with information that an unnamed assistant (or more precisely an "assistant to an assistant") to U.S. Secretary of State Stettinius was a Soviet agent. When informed of this, Hoover assumed Gouzenko was referring to Alger Hiss. Three months later (in December 1945), Elizabeth Bentley, an American spy for the Soviet Union, who served also as a courier between Communist groups, told the FBI, as documented in the FBI Silvermaster File that "At this time Kramer told me that the person who had originally taken Glasser away from Perlo's group was named Hiss and that he was in the U.S. State Department." Bentley also said that the man in question, whom she called "Eugene Hiss" worked in the State Department and was an adviser to Dean Acheson. In both cases (Gouzenko and Bentley), the FBI decided that Alger Hiss was the likely match. Hoover put a wiretap on Hiss's home phone and had him and his wife investigated and tailed for the next two years. In response to Chambers's accusations, Hiss protested his innocence and insisted on appearing before HUAC to clear himself. Testifying on August 5, 1948, he denied having ever been a Communist or having personally met Chambers. Under fire from President Truman and the press, the Committee was reluctant to proceed with its investigation against so eminent a man. Committee member Richard Nixon, however, a Congressman from California, who later described Hiss's demeanor that day as, "insolent," "condescending," and "insulting in the extreme," wanted to press on. Nixon had received secret information about the FBI's suspicions from John Francis Cronin, a Roman Catholic priest who had infiltrated labor unions in Baltimore during World War II to report on Communist activities and had been given access to FBI files. Writing in a paper titled "The Problem of American Communism In 1945", Cronin wrote, "In the State Department, the most influential Communist has been Alger Hiss." With some reluctance, the Committee voted to make Nixon chair of a subcommittee that would seek to determine who was lying, Hiss or Chambers, at least on the question of whether they knew one another. HISS. Did you ever go under the name of George Crosley? CHAMBERS. Not to my knowledge. HISS. Did you ever sublet an apartment on Twenty-ninth Street from me? CHAMBERS. No; I did not. HISS. Did you ever spend any time with your wife and child in an apartment on Twenty-ninth Street in Washington when I was not there because I and my family were living on P Street? CHAMBERS. I most certainly did. HISS. You did or did not? HISS. Would you tell me how you reconcile your negative answers with this affirmative answer? CHAMBERS. Very easily, Alger. I was a Communist and you were a Communist. Chambers's statements, because they were made in a Congressional hearing, were privileged against defamation suits; Hiss challenged Chambers to repeat them without benefit of such protection. When, on the national radio program Meet the Press, Chambers publicly called Hiss a communist, Hiss had attorney William L. Marbury Jr. file a libel lawsuit against him. Chambers retaliated by claiming Hiss was not merely a communist but also a spy, a charge he had not made earlier; and, on November 17, 1948, to support his explosive allegations he produced physical evidence consisting of sixty-five pages of re-typed State Department documents, the last of which was dated April 1, 1938, plus four notes in Hiss's handwriting summarizing the contents of State Department cables. These became known as the "Baltimore documents". Chambers claimed Hiss had given them to him in 1938 and that Priscilla had retyped them (Hiss could not type) on the Hisses' Woodstock typewriter for Chambers to pass along to the Soviets. One of the handwritten notes copied the contents of a telegram (received January 28, 1938) related to the November and December 1937 arrest and disappearance in Moscow of a Latvian-born man and his wife, an American citizen. Under questioning, neither Hiss nor his superior, Francis Sayre, recollected the incident. Hiss initially denied writing the note, but experts confirmed it was his handwriting. Interrogated in 1949, Sayre stated that the telegram was unrelated to Hiss's duties, which concerned trade matters and told his questioners, "He could not understand why he was on the distribution list for this cable nor why the note would be made on it or especially why an exact copy should be made." In their previous testimony, both Chambers and Hiss had denied having committed espionage. By introducing the Baltimore documents, Chambers admitted he had previously lied, opening both Hiss and himself to perjury charges. Chambers also gave a new date for his own break with the Communist Party, an important point in his accusations against Hiss. For over nine years, beginning September 1, 1939, he had claimed to have quit the Party in 1937. Chambers now began to claim the actual date was sometime in early March 1938, the year of the "Baltimore documents," before finally settling during the trial, on April 15, 1938. On December 2, Chambers led HUAC investigators to a pumpkin patch on his Maryland farm; from a hollowed-out pumpkin in which he had hidden them the previous day, he produced five rolls of 35 mm film that he said came from Hiss in 1938, as well. While some of the film was undeveloped and some contained images of trivial content such as publicly available Navy documents concerning the painting of fire extinguishers, there were also images of State Department documents that were classified at the time. As a consequence of the revelation's dramatic staging, both the film and the Baltimore documents soon became known collectively as the "Pumpkin Papers." The grand jury charged Hiss with two counts of perjury—it did not indict him for espionage since the period of limitations had run out. Chambers was never charged with a crime. Hiss went to trial twice. The first trial, presided over by Judge Samuel Kaufman, started on May 31, 1949, and ended in a hung jury on July 7. Chambers admitted on the witness stand that he had previously committed perjury several times while he was under oath, including deliberately falsifying key dates in his story. Hiss's character witnesses at his first trial included such notables as future Democratic presidential candidate Adlai Stevenson, Supreme Court Justices Felix Frankfurter, and Stanley Reed, and former Democratic presidential candidate John W. Davis. President Truman famously called the trial "a red herring." The second trial, presided over by Judge Henry W. Goddard, lasted from November 17, 1949, to January 21, 1950. At both trials, a key to the prosecution's case was testimony from expert witnesses, stating that identifying characteristics of the typed Baltimore documents matched samples typed on a typewriter owned by the Hisses at the time of his alleged espionage work with Chambers. The prosecution also presented as evidence the typewriter itself. Given away years earlier, it had been located by defense investigators. This trial resulted in an eight-to-four deadlocked jury. "That, according to one of Hiss's friends and lawyers, Helen Buttenweiser, was the only time that she had ever seen Alger shocked—stunned by the fact that eight of his fellow citizens did not believe him." In the second trial, Hede Massing, an Austrian-born confessed Soviet spy who was being threatened with deportation, and whom the first judge had not permitted to testify, provided some slight corroboration of Chambers's story. She recounted meeting Hiss at a party in 1935. Massing also described how Hiss had tried to recruit Noel Field, another Soviet spy at State, to switch from Massing's ring to his own. This time the jury found Hiss guilty. According to Anthony Summers, "Hiss spoke only two sentences in court after he had been found guilty. The first was to thank the judge. The second was to assert that one day in the future it would be disclosed how forgery by typewriter had been committed." On January 25, 1950, Judge Goddard sentenced Hiss to five years' imprisonment on each of the two counts, to run concurrently. At a subsequent press conference, Secretary of State Dean Acheson reacted emotionally, affirming, "I do not intend to turn my back on Alger Hiss." Acheson quoted Jesus in the Bible: "I was a Stranger and ye took me in; Naked, and ye clothed me; I was sick and ye visited me; I was in prison and ye came unto me." Acheson's remarks enraged Nixon, who accused him of blasphemy. The verdict was upheld by the United States Court of Appeals for the Second Circuit, and the Supreme Court of the United States denied a writ of certiorari. The case heightened public concern about Soviet espionage penetration of the U.S. government in the 1930s and 1940s. As a well-educated and highly connected government official from an old American family, Alger Hiss did not fit the profile of a typical spy. Publicity surrounding the case thrust Richard M. Nixon into the public spotlight, helping him move from the U.S. House of Representatives to the U.S. Senate in 1950, to the Vice Presidency of the United States in 1952, and finally to President of the United States in 1968. Senator Joseph McCarthy made his famous speech at Wheeling, West Virginia, two weeks after the Hiss verdict, launching his career as the nation's most visible anti-communist. Although he had been sentenced to five years' imprisonment, Hiss served only three years and eight months in Lewisburg Federal Prison. He was released from prison on November 27, 1954. While in prison, Hiss acted as a volunteer attorney, adviser, and tutor for many of his fellow inmates. After his release in 1954, Hiss, who had been disbarred, worked as a salesman for the stationery company S. Novick & Sons located in the Puck Building, 225 Lafayette St. in New York City. In 1957, he published In the Court of Public Opinion, a book challenging in detail the prosecution's case against him, and maintaining the typewritten documents traced to his typewriter had been forged. Hiss separated from his first wife, Priscilla, in 1959, though they remained married until her death in 1984. In 1985 he married Isabel Johnson, who had been living with him since soon after they met in 1960. On November 11, 1962, following Richard Nixon's failed 1962 bid for governor of California, Hiss appeared in a segment titled "The Political Obituary of Richard M. Nixon" on the Howard K. Smith: News and Comment show on ABC television. (The Chicago Tribune reported targets of Hiss's "invective" and whom he "denounced as conspirators in a monstrous plot to convict him on concocted evidence" included: the presiding judge at his second trial, the three appellate court justices who rejected his appeal, J. Edgar Hoover and the FBI, assistant attorney general Alexander M. Campbell, federal prosecutor Thomas F. Murphy, members of the New York grand jury who indicted him, jury members in his two trials who convicted him, and HUAC members and particularly Richard Nixon and Karl Mundt.") His appearance led sponsors to withdraw from Smith's program when viewers bombarded ABC with complaints about letting a convicted perjurer appear on the air. Smith's show was cancelled in June 1963. The five rolls of 35 mm film known as the "pumpkin papers" had been characterized as highly classified and too sensitive to reveal and were thought until late 1974 to be locked in HUAC files. In 1975, independent researcher Stephen W. Salant, an economist at the University of Michigan, sued the U.S. Justice Department when it denied his request for access to them under the Freedom of Information Act. On July 31, 1975, as a result of this lawsuit and follow-on suits filed by Peter Irons and by Alger Hiss and William A. Reuben, the Justice Department released copies of the "pumpkin papers" that had been used to implicate Hiss. One roll of film turned out to be totally blank due to overexposure, two others are faintly legible copies of non-classified Navy Department documents relating to such subjects as life rafts and fire extinguishers, and the remaining two are photographs of the State Department documents that had been introduced at the two Hiss trials. A few days after the release of the Pumpkin Papers, on August 5, 1975, Hiss was readmitted to the Massachusetts bar. The state's Supreme Judicial Court overruled its Committee of Bar Overseers and stated in a unanimous decision that, despite his conviction, Hiss had demonstrated the "moral and intellectual fitness" required to be an attorney. Hiss was the first lawyer ever readmitted to the Massachusetts bar after a major criminal conviction. In 1988 Hiss wrote an autobiography, Recollections of a Life, in which he maintained his innocence. He fought his perjury conviction until his death at age 92, from emphysema on November 15, 1996, at Lenox Hill Hospital in New York City. His friends and family continue to insist on his innocence. In 1952, former US Ambassador to France William C. Bullitt testified before the McCarran Committee (the Senate Internal Security Subcommittee) that in 1939, Premier Édouard Daladier had advised him of French intelligence reports that two State Department officials named Hiss were Soviet agents. When asked about it the next day, Daladier, then 68 years old, told reporters that he did not recall this conversation from 13 years previously. Also called to testify before the McCarran committee was economist Nathaniel Weyl, a former Communist Party member "at large" who had worked for the Department of Agriculture during the early days of the New Deal and had become disillusioned with what he considered the underhanded methods of the Communist Party. In 1950 Weyl had been interviewed by the FBI and had told them that in 1933 he had belonged to a secret Communist Party unit along with Harold Ware and Lee Pressman and confirmed that Alger Hiss had been present at some meetings held at Ware's sister's violin studio. Weyl's is thus the only testimony appearing to corroborate some of Chambers's allegations. In 1950 Weyl, however, had published an anti-communist book, Treason: The Story of Disloyalty and Betrayal in American History (1950) that made no mention of the so-called "Ware Group." Moreover, in this book, which came out shortly after Hiss's conviction, Weyl expressed doubt that Alger Hiss had been guilty of espionage. At both trials FBI typewriter experts testified that the Baltimore documents in Chambers's possession matched samples of typing done in the 1930s by Priscilla Hiss on the Hisses' home typewriter, a Woodstock brand. As early as December 1948 the chief investigator for the Hiss defense, Horace W. Schmahl, set off a race to find Hiss's typewriter. The FBI, with superior resources was also searching for the typewriter, which the Hiss family had discarded some years earlier. Nevertheless, Schmahl was able to track it down first, and the Hiss defense introduced it with the intention of showing that its typeface would not be a match for that on the FBI's documents. Surprisingly, however, the typefaces proved to be an excellent match and seemed to confirm the FBI's evidence. Schmahl subsequently changed sides and went to work for the prosecution. After Hiss had gone to prison, his lawyer, Chester T. Lane, acting on a tip he had received from someone who had worked with Schmahl that Hiss might have been framed, filed a motion in January 1952 for a new trial. Lane sought to show that (1) forgery by typewriter was feasible and (2) such forgery had occurred in the Hiss case. Unaware that the feasibility of such forgeries had already been established throughout the War by the military intelligence services that engaged in such practices, the Hiss defense sought to establish feasibility directly by hiring a civilian typewriter expert, Martin Tytell, to create a typewriter that would be indistinguishable from the one the Hisses owned. Tytell spent two years creating a facsimile Woodstock typewriter whose print characteristics would match the peculiarities of the Hiss typewriter. To demonstrate that forgery by typewriter was not merely a theoretical possibility but had actually occurred in the Hiss case, the defense sought to show that Exhibit #UUU was not Hiss's old machine but a newer one altered to type like it. According to former Woodstock executives, the production date of a machine could be inferred from the machine's serial number. The serial number on the Exhibit #UUU typewriter indicated that it would have been manufactured after the man who sold the Hiss machine had retired from the company and the salesman insisted that he did not sell any typewriters after his retirement. Decades later, when FBI files were disclosed under the Freedom of Information Act, it turned out that the FBI had also doubted that the trial exhibit was Hiss's machine and for exactly the same reasons; although the FBI expressed these concerns internally as the first trial was about to begin, the public did not learn about the FBI's doubts until the mid-1970s. To explain why typing from Exhibit #UUU seemed indistinguishable from the typing on Hiss's old machine, Lane assembled experts prepared to testify that Exhibit #UUU had been tampered with in a way inconsistent with professional repair work to make it type like Hiss's old typewriter. In addition, experts were prepared to testify that Priscilla Hiss was not the typist of the Baltimore documents. In summarizing the conclusions of the forensic experts he had assembled in his motion for a new trial, Lane told the court, "I no longer just question the authenticity of Woodstock N230099. I now say to the Court that Woodstock N230099—the typewriter in evidence at the trials—is a fake machine. I present in affidavit form, and will be able to produce at the hearing, expert testimony that this machine is a deliberately fabricated job, a new type face on an old body. This being so, it can only have been planted on the defense by or on behalf of Whittaker Chambers as part of his plot for the false incrimination of Alger Hiss." In July 1952 Judge Goddard denied Hiss's motion for a new trial, expressing great skepticism that Chambers had the resources, knew how to commit forgery by typewriter, and would have known where to plant such a fake machine so it would be found. In his decision, Goddard did not address the possibility, raised by Hiss's defenders, that someone other than Chambers, namely Horace Schmahl and/or his associates on the prosecution side, might have been involved in faking the typewriter. The FBI illegally withheld important evidence from the Hiss defense team, specifically that typewritten documents could be forged. Unknown to the defense, military intelligence operatives in World War II, a decade before the trials, "could reproduce faultlessly the imprint of any typewriter on earth." With regard to the Woodstock No. 230099 typewriter introduced as Exhibit #UUU by the defense at the trial, the FBI knew there was an inconsistency between its serial number and the manufacture date of Hiss's machine but illegally withheld this information from Hiss. That the FBI had an informer on the Hiss defense team, a private detective named Horace W. Schmahl. Hired by the Hiss defense team, Schmahl reported on the Hiss defense strategy to the government. That the FBI had conducted illegal surveillance of Hiss before and during the trials, including phone taps and mail openings. Also that the prosecution had withheld from Hiss and his lawyers the records of this surveillance, none of which provided any evidence that Hiss was a spy or a Communist. Federal Judge Owen, in denying Hiss's coram nobis petition, quoted verbatim two points made by Judge Goddard in denying Hiss's appeal for a new trial 30 years earlier, namely, that "there is not a trace of any evidence that Chambers had the mechanical skills, tools, equipment or material for such a difficult task [as typewriter forgery]," and that "If Chambers had constructed a duplicate machine, how would he have known where to plant it so that it would be found by Hiss?" Stephen Salant, whose FOIA requests had revealed to the public the contents of the "pumpkin papers," has documented that Schmahl was a trained Army "spy-catcher" (as they called themselves), a special agent in the Counter Intelligence Corps (CIC). While on the payroll of the Hiss defense and searching for Hiss's typewriter, Schmahl confided to the FBI that his "present employment" in December 1948 was with Military Intelligence; his claim has not yet been independently verified. At the Military Intelligence Training Center, CIC agents learned the rudiments of forgery and how to detect it through matching of typed samples with the typewriter that produced them. During the 1940s the CIC's domestic surveillance of civilians was extensive but so covert that it usually escaped notice. When detected, undercover CIC agents were often mistaken for FBI agents, since only the Bureau was authorized to investigate civilians. During the 1930s Army counterintelligence monitored another suspected communist connected to Chambers, Franklin Vincent Reno, a civilian employed at the Aberdeen Proving Ground, who shortly afterwards passed information about U.S. Army weapons to Chambers. It is not known if U.S. Army counterintelligence monitored Chambers' other associates, but when Hiss presided over the UN Charter Conference, more than a hundred undercover CIC agents were in attendance. In his 1976 memoir, former White House counsel John Dean states that President Nixon's chief counsel Charles Colson told him that Nixon had admitted in a conversation that HUAC had fabricated a typewriter, saying, "We built one on the Hiss case." According to Anthony Summers, "When Dean's book was published, Colson protested that he had 'no recollection of Nixon's having said the typewriter was 'phonied,'" and Nixon himself characterized the claim as 'totally false.' Dean, however, insisted that his contemporaneous notes confirmed that Colson had quoted the President as he indicated and seemed serious when he did so." Summers and others suggest that Dean's version of events is plausible: "'Had Nixon asked the FBI to manufacture evidence to prove his case against Hiss,' opined former FBI Assistant Director Sullivan, 'Hoover would actually been only too glad to oblige.'" As to whether Nixon would actually have gone as far as to frame Hiss, Summers notes, "the later record includes disquieting instances of forgery or planting false information." We won the Hiss case in the papers. We did. I had to leak stuff all over the place. Because the Justice Department would not prosecute it. Hoover didn't even cooperate.... It was won in the papers. I leaked out the papers.... I leaked out the testimony. I had Hiss convicted before he ever got to the grand jury.... Go back and read the chapter on the Hiss case in Six Crises and you’ll see how it was done. It wasn't done waiting for the goddamn courts or the attorney general or the FBI. The one substantive piece of information indicating typewriter forgery features the OSS and its chief, William Donovan. In late 1948, when the Hiss defense and the FBI began hunting for the Woodstock typewriter, a man named Horace Schmahl joined the defense team as an investigator. Schmahl had worked for either the OSS or army intelligence during the war, then joined the Central Intelligence Group, which operated between the closedown of the OSS and the inception of the CIA. After his stint for the Hiss side, Schmahl defected to the prosecution team. [I]f there existed any persons with the means, motive, and opportunity to "substitute" a different Woodstock for the Hiss machine in the months after Hiss's indictment, the evidence ... indicates the possible conspirators, Mike Catlett and Donald Hiss, who for two months withheld knowledge from Alger's lawyers that the typewriter had been traced to Ira Lockey. In 1992, records were found in Hungarian Interior Ministry archives in which self-confessed Soviet spy Noel Field named Alger Hiss as a fellow agent. An American citizen from a Quaker family who had grown up in Switzerland, Field attended Harvard and worked in the US Foreign Service from 1929 until 1936, when he left the State Department for a job at the League of Nations in Geneva, helping refugees from the Spanish Civil War. During World War II, Field, who never concealed he was a Communist, headed a Unitarian Services organization to aid displaced persons in Marseilles, before fleeing to Geneva, where he collaborated with Allen Dulles of the OSS (who was based in Bern). In 1948, when the Hiss trials started, Field and his German wife were still living in Switzerland. By 1949 Field was broke, having been fired from the U.S.-based Unitarian Services Committee for his Communist associations. Wishing to avoid returning to the United States and possibly having to testify before Congress, Field traveled to Prague, hoping to be hired as a lecturer at the Charles University. Instead, he was seized by Stalinist security services from Poland and Czechoslovakia and secretly imprisoned in Hungary. Field was accused of having organized an anti-Communist resistance network in Eastern Europe for the OSS during the war and later for the new CIA and was held for five years in solitary confinement. Repeatedly interrogated under rigorous torture, Field broke down and confessed to being "head of the U.S. Secret Service", under his controller, Allen Dulles, "the famous pro-Nazi OSS spymaster". While being "rehabilitated" after the torture had ceased, Field referred four times to Hiss as a Soviet agent, for example: "Around the summer of 1935 Alger Hiss tried to induce me to do service for the Soviets. I was indiscreet enough to tell him he had come too late." This agreed with Hede Massing's assertion to US authorities in 1947 that when she attempted to recruit Noel Field for one Soviet spy network (the OGPU), Field had replied that he already worked for another (the GRU). (Massing repeated this story at Hiss's second trial when she testified that at a party at Noel Field's house in 1935 she had obliquely joked with Hiss about recruiting Noel Field.) In 1954, the Hungarian secret police released Field, exonerating him. He then formally wrote to the Communist Party's Central Committee in Moscow stating for the record that the tortures he had undergone in captivity had made him "confess more and more lies as truth". Hiss's defenders argue that Field's implications of Hiss may well have been among those lies. Field remained in Communist Hungary until his death in 1970. In public Field continued to maintain Hiss was innocent and, in 1957, wrote Hiss a letter calling Hede Massing's dinner party story "the false testimony of a perjured witness" and an "outrageous lie". In 1995, the CIA and the NSA for the first time made public the existence of the World War II Venona project, which, beginning in 1943, had decrypted or partially decrypted thousands of telegrams sent from 1940 to 1948 to the primary Soviet foreign intelligence agency—for most of that period, the NKVD—by its U.S. operatives. Although known to the FBI, VENONA had been kept secret even from President Truman. One cable, Venona #1822, mentioned a Soviet spy codenamed "ALES" who worked with a group of "Neighbors"—members of another Soviet intelligence organization, such as the military's GRU. FBI Special Agent Robert J. Lamphere, who supervised the FBI's spy chasing squad, concluded that the codename "ALES" was "probably Alger Hiss". In 1997, Allen Weinstein, in the second edition of his 1978 book Perjury: The Hiss-Chambers Case, calls the Venona evidence "persuasive but not conclusive". The bipartisan Moynihan Commission on Government Secrecy, chaired by Democratic Senator Daniel Patrick Moynihan, however, stated in its findings that year: "The complicity of Alger Hiss of the State Department seems settled. As does that of Harry Dexter White of the Treasury Department." In his 1998 book Secrecy: The American Experience, Moynihan wrote, "Belief in the guilt or innocence of Alger Hiss became a defining issue in American intellectual life. Parts of the American government had conclusive evidence of his guilt, but they never told." In their numerous books, Harvey Klehr, professor of political science at Emory University, and John Earl Haynes, historian of twentieth-century politics at the Library of Congress, have mounted an energetic defense of Lamphere's conclusion that ALES indeed referred to Alger Hiss.National Security Agency analysts have also gone on record asserting that ALES could only have been Alger Hiss. The Venona transcript # 1822, sent March 30, 1945, from the Soviets' Washington station chief to Moscow, appears to indicate that ALES attended the February 4–11, 1945, Yalta conference and then went to Moscow. Hiss did attend Yalta and then traveled to Moscow with Secretary of State Stettinius. ALES was said to be the leader of a small group of espionage agents but, apart from using his wife as a typist and Chambers as courier, Hiss was alleged by the prosecution to have acted alone. The CIA, however, concluded the "small group" comprised Alger, his wife Priscilla, and brother Donald. ALES was a GRU (military intelligence) agent who obtained military intelligence and only rarely provided State Department material. In contrast, during his trial, Alger Hiss, an employee of the State Department, was accused of having obtained only non-military information, and the papers he was accused of having passed to the Soviets on a regular basis were non-military, State Department documents. Even had Hiss been a spy as alleged, after 1938 he would have been unlikely to have continued espionage activities as ALES did, since in 1938 Whittaker Chambers had broken with the Communist Party and gone into hiding, threatening to denounce his Communist Party colleagues unless they followed suit. Had Hiss been ALES, his cover would thus have been in extreme jeopardy and it would have been too risky for any Soviet agency to continue using him. Lowenthal suggests that ALES was not at the Yalta conference at all and that the cable instead was directed to Soviet deputy foreign minister Andrey Vyshinsky. According to Lowenthal, in paragraph six of Venona #1822, the GRU asks Vyshinsky to get in touch with ALES to convey thanks from the GRU for a job well done — which would have been unnecessary if ALES had actually gone to Moscow, because the GRU could have thanked him there in person. Eduard Mark of the Center for Air Force History hotly disputed this analysis. In 2005, NSA released the original Russian of the Venona texts. At a symposium held at the Center for Cryptologic History that year, intelligence historian John R. Schindler concluded that the Russian text of Venona #1822 made clear that ALES was indeed at Yalta: "the identification of ALES as Alger Hiss, made by the U.S. Government more than a half-century ago, seems exceptionally solid, based on the evidence now available; message 1822 is only one piece of that evidence, yet a compelling one." None of the evidence presented at the Hiss trial precludes the possibility that Hiss could have been an espionage agent after 1938 or that he had only passed State Department documents after 1938. Chambers's charges were not seriously investigated until 1945 when Elizabeth Bentley defected, so the Soviets could in theory have considered it an acceptable risk for him continue his espionage work even after Chambers's 1938 defection. Vyshinsky was not in the U.S. between Yalta and the time of the Venona message, and the message is from the Washington KGB station reporting on a talk with ALES in the U.S., rendering Lowenthal's analysis impossible. An earlier Venona document, #1579, had actually mentioned "HISS" by name. This partially decrypted cable consists of fragments of a 1943 message from the GRU chief in New York to headquarters in Moscow and reads: "from the State Department by name of HISS" (with "HISS" "spelled out in the Latin alphabet", according to a footnote by the cryptanalysts). "HISS" could refer either to Alger or Donald Hiss, both State Department officials at that time. Lowenthal argued that had Alger Hiss really been a spy, the GRU would not have mentioned his real name in a coded transmission, since this was contrary to their usual practice. At an April 2007 symposium, authors Kai Bird and Svetlana Chervonnaya postulated that, based on the movements of officials present at Yalta, Wilder Foote, a U.S. diplomat, not Hiss, was the best match for ALES. They note Foote was in Mexico City when a Soviet cable placed ALES there, whereas Hiss had left several days earlier for Washington (see above). In response, Haynes and Klehr point out that Foote doesn't fit other aspects of the description of ALES (Foote was publishing newspapers in Vermont at the time when ALES was said to have been working for Soviet military intelligence) and suggest that the cable came from someone who managed KGB assets (rather than GRU assets like ALES) and may have been mistaken when he stated that ALES was still in Mexico City. Mark also disputes that Foote was ALES, arguing that Foote was never shown to be associated with the Communists or any foreign intelligence services; Hiss was the "one possible candidate" who could have been ALES, Mark contends. In 1985, a high-ranking KGB agent, Oleg Gordievsky (b. 1938), who was recruited in 1974 to become a British double agent, defected and wrote a series of memoirs, in one of which, The KGB (1990), he recalled attending a lecture given before a KGB audience by Iskhak Abdulovich Akhmerov, who identified Hiss as a World War II Soviet agent. Gordievsky went further and claimed that Hiss had the codename identity of "ALES". Appearing before the VENONA cables were made public, this at first appeared to be independent corroboration of the codename, but it was later revealed that Gordievsky's source for the ALES identity was an article by journalist Thomas Powell, who had seen National Security Agency documents on VENONA years before their release. Gordievsky's status as a reliable source was challenged in the British media. After the dissolution of the Soviet Union in 1991, Alger Hiss petitioned General Dmitry Antonovich Volkogonov, who had become President Yeltsin's military advisor and the overseer of all the Soviet intelligence archives, to request the release of any Soviet files on the Hiss case. Both former President Nixon and the director of his presidential library, John H. Taylor, wrote similar letters, though their full contents are not yet publicly available. Russian archivists responded by reviewing their files, and in late 1992 reported back that they had found no evidence Hiss ever engaged in espionage for the Soviet Union nor that he was a member of the Communist Party. However, Volkogonov subsequently stated he spent only two days on the search and had mainly relied on the word of KGB archivists. "What I saw gave me no basis to claim a full clarification", he said. Referring to Hiss's lawyer, he added, "John Lowenthal pushed me to say things of which I was not fully convinced." General-Lieutenant Vitaly Pavlov, who ran Soviet intelligence work in North America in the late 1930s and early 1940s for the NKVD said that Hiss never worked for the USSR as one of his agents. In 2003, retired Russian intelligence official General Julius Kobyakov disclosed that it was he who had actually searched the files for Volkogonov. Kobyakov stated that Hiss did not have a relationship with SVR predecessor organizations, although Hiss was accused of being with the GRU, a military intelligence organization separate from SVR predecessors. In 2007, Svetlana Chervonnaya, a Russian researcher who had been studying Soviet archives since the early 1990s, argued that based on documents she reviewed, Hiss was not implicated in spying. In May 2009, at a conference hosted by the Wilson Center, Mark Kramer, director of Cold War Studies at Harvard University at the John F. Kennedy School of Government, stated that he did not "trust a word [Kobyakov] says", At the same conference, historian Ronald Radosh reported that while researching the papers of Marshal Voroshilov in Moscow, he and Mary Habeck had encountered two GRU (Soviet military intelligence) files referring to Alger Hiss as "our agent". In 2009, Haynes, Klehr, and Alexander Vassiliev published Spies: The Rise and Fall of the KGB in America, based on KGB documents reportedly hand-copied by Vassiliev, a former KGB agent, during the 1990s. The authors attempted to show definitively that Alger Hiss had indeed been a Soviet spy and argue that KGB documents prove not only that Hiss was the elusive ALES, but that he also went by the codenames "Jurist" and "Leonard" while working for the GRU. Some documentation brought back by Vassiliev also refers to Hiss by his actual name, leaving no room, in the authors' opinion, for doubt about his guilt. Calling this the "massive weight of accumulated evidence", Haynes and Klehr conclude, "to serious students of history continued claims for Hiss's innocence are akin to a terminal case of ideological blindness." In a review published in the Journal of Cold War Studies, military historian Eduard Mark heartily concurred, stating that the documents "conclusively show that Hiss was, as Whittaker Chambers charged more than six decades ago, an agent of Soviet military intelligence (GRU) in the 1930s." Newsweek magazine reported that Civil Rights Movement historian David Garrow also concluded that, in his opinion, Spies "provides irrefutable confirmation of [Hiss's] guilt". Other historians, such as D. D. Guttenplan, Jeff Kisseloff, and Amy Knight, however, assert that Spies' conclusions were not borne out by the evidence and accused its authors of engaging in "shoddy" research. Guttenplan stresses that Haynes and Klehr never saw and cannot even prove the existence of the documents that supposedly convict Hiss and others of espionage, but rather relied exclusively on handwritten notebooks authored by Vassiliev during the time he was given access to the Soviet archives in the 1990s while he collaborated with Weinstein. According to Guttenplan, Vassiliev could never explain how he managed, despite being required to leave his files and notebooks in a safe at the KGB press office at the end of each day, to smuggle out the notebooks with his extensive transcriptions of documents. Haynes and Klehr respond that the material was examined by historians, archivists, and intelligence professionals who unanimously agreed that the material was genuine. Guttenplan also suggested, moreover, that Vassiliev might have omitted relevant facts and selectively replaced cover names with his own notion of the real names of various persons. According to Guttenplan, Boris Labusov, a press officer of the SVR, the successor to the KGB, has stated that Vassiliev could not in the course of his research have possibly "met the name of Alger Hiss in the context of some cooperation with some special services of the Soviet Union". Guttenplan also points out that Vasiliev admitted under oath in 2003 that he'd never seen a single document linking Hiss with the cover name "Ales". However, Haynes and Klehr also cite a 1950 memo indicating that a GRU agent, described as a senior State Department official, had recently been convicted in an American court. "The only senior American diplomat convicted of an espionage-related crime in 1950 was Alger Hiss." Historian Jeff Kisseloff questions Haynes and Klehr's conclusion that Vassiliev's notes support Hede Massing's story about talking to Hiss at a party in 1935 about recruiting their mutual friend and host Noel Field into the Communist underground. According to Kisseloff, "all that the files Vassiliev saw really indicate is that she was telling yet another version of her story in the 1930s. Haynes and Klehr never consider that, as an agent in Washington, D.C., who was having little success in the tasks assigned to her, she may have felt pressure back then to make up a few triumphs to reassure her superiors." Kisseloff also disputes Haynes and Klehr's linking of Hiss with former Treasury Department official Harold Glasser, who they allege was a Soviet agent. Finally, Kisseloff states that some of the evidence compiled by Haynes and Klehr actually tends to exonerate rather than convict Hiss. For example, their book cites a KGB report from 1938 in which Iskhak Akhmerov, New York station chief, writes, "I don't know for sure who Hiss is connected with." Haynes and Klehr also claim that Hiss was the agent who used the cover name "Doctor". According to Soviet sources, however, "Doctor" was a middle-aged Bessarabian Jew who was educated in Vienna. Other historians[not in citation given] felt that Haynes and Klehr's information was suspect because their publisher, Crown (a division of Random House), obtained temporary and limited access to KGB files through a payment of money (amount unspecified) to a pension fund for retired KGB agents, of whom Vassiliev was one, as was KGB archivist Volkogonov. Other historians had not been permitted to verify Vassiliev's data. In 2002, Vassiliev sued John Lowenthal for libel in a British court of law for publishing a journal article questioning his conclusions. Vassiliev lost the case before a jury and was further reprimanded by The Times for trying to exert a "chilling effect" on scholarship by resorting to the law courts. Vassiliev has since also unsuccessfully sued Amazon.com for publishing a customer review critical of his work. In 1978, Victor Navasky interviewed six people Weinstein had quoted in his book Perjury, who all claimed to have been misquoted by Weinstein. One, Sam Krieger, won a cash payment from Weinstein, who issued an apology and promised to correct future editions of his book and to release his interview transcripts, which he subsequently failed to do. ^ Trussell, C.P. (August 3, 1948). "Red 'Underground' in Federal Posts Alleged by Editor: In New Deal Era – Ex-Communist Names Alger Hiss, Then in State Department – Wallace Aides on List – Chambers Also Includes Former Treasury Official, White -Tells of Fears for His Life". New York Times. Retrieved January 25, 2017 – via Proquest NYTimes Historical. ^ Rosenbaum, Ron (July 16, 2007). "Alger Hiss Rides Again". Slate. Archived from the original on December 11, 2007. Retrieved November 13, 2007. ^ Anthony Summers, The Arrogance of Power: The Secret World of Richard Nixon (New York, London: Penguin-Putnam Inc, 2000), p. 77. "... the vast majority [sic] of modern American historians today and particularly those specializing in domestic Cold War accept Chambers' overall version of events." Oshinsky, David (April 5, 2007). "Transcript, Alger Hiss and History, Inaugural Conference" (PDF). New York University, Center for the United States and the Cold War. "Yet the weight of historical evidence indicates that Hiss was ... a member of the communist underground and a Soviet spy." Elson, John (November 25, 1996). "Gentleman and Spy?". Time. "The case against Hiss, which has been strong but controversial ever since his conviction for perjury... is now overwhelming as a result of new evidence... from the VENONA decrypts, KGB files made available to Weinstein and Vassiliev... and Hungarian interrogation records of Hiss's fellow agent Noel Field." Andrew, Christopher; Mitrokhin, Vasili (1999). The Sword and the Shield: The Mitrokhin Archive and the Secret History of the KGB. New York: Basic Books. p. 591. ISBN 978-0-465-00310-5. "In the end, the publication of the Venona intercepts ... settled the matter—to all but the truest of believers." Stanley I. Kutler (August 6, 2004). "Rethinking the Story of Alger Hiss". FindLaw. "Most historians have conceded the argument to Weinstein. They have done so, however, not because the evidence against Hiss is clear and definitive, but because the evidence box—filled as it is with a morass of circumstantial detail—leaves them the easy option of finding him guilty of some form of espionage activity during his murky relationship with Chambers." Bird, Kai; Chervonnaya, Svetlana (Summer 2007). "The Mystery of Ales". American Scholar. "The question of his guilt or innocence remains controversial." Svetlana Chervonnaya Hiss, Alger (1904 – 1996) DocumentsTalk.com. Accessed: 2010-09-09. ^ a b c d Levitt, Morton; Levitt, Michael (1979). A Tissue Of Lies: Nixon vs. Hiss. New York: McGraw Hill. pp. 255–56. ^ Kempton, Murray (2012). Part of Our Time: Some Ruins and Monuments of the Thirties. New York Review of Books. p. 17. ISBN 978-1590175446. Retrieved January 26, 2015. ^ a b White, G. Edward (2004). Alger Hiss's Looking-Glass Wars: The Covert Life of a Soviet Spy. Oxford University Press. pp. 3–4. ISBN 978-0195348408. Retrieved June 13, 2017. ^ See "Merchants of Death", on the U.S. Senate website. ^ The following year the Supreme Court ruled the AAA unconstitutional, though Congress reinstated it in 1938. See John C. Culver, John Hyde, American Dreamer, a Life of Henry A. Wallace (New York: W. W. Norton) pp. 143–57. ^ "Munitions industry, naval shipbuilding: Preliminary Report of the Special Committee on Investigation of the Munitions Industry". Washington: US Government Printing Office (GPO). September 1934. p. 691. Retrieved November 23, 2016. ^ "Munitions industry, naval shipbuilding: Preliminary Report of the Special Committee on Investigation of the Munitions Industry". Washington: US Government Printing Office (GPO). December 10, 1934. pp. ii. Retrieved November 23, 2016. ^ "Munitions industry, naval shipbuilding: Preliminary Report of the Special Committee on Investigation of the Munitions Industry". Washington: US Government Printing Office (GPO). December 18, 1934. pp. ii. Retrieved November 23, 2016. ^ "Munitions industry, naval shipbuilding: Preliminary Report of the Special Committee on Investigation of the Munitions Industry". Washington: US Government Printing Office (GPO). 1935. pp. ii. Retrieved November 23, 2016. ^ Weinstein, Allen (1978). Perjury: The Hiss-Chambers Case. New York. ISBN 9780817912260. Retrieved November 23, 2016. ^ "Munitions industry. Preliminary report on wartime taxation and price control". US Government Printing Office (US GPO). August 20, 1935. pp. 23, 28, 60, 113–115, 127. Retrieved November 23, 2016. ^ Smith, John Chabot (1976). Alger Hiss, the true story. New York: Holt, Rinehart and Winston. pp. 83–84. ISBN 9780030137761. Retrieved November 23, 2016. ^ Herman, Arthur (2002). Joseph McCarthy: Reexamining the Life and Legacy of America's Most Hated Senator. New York: Simon & Schuster. pp. 220–221. ISBN 9780684836256. Retrieved November 23, 2016. ^ Marbury, Jr., William L. (1988). In the Catbird Seat. Maryland Historic Society. p. 253 (award), 263 (Baruch). ^ Hiss, Alger (1988). Recollections of a Life. New York: Seaver/Henry Holt. p. 82. ISBN 9780805006124. Retrieved November 23, 2016. ^ Allen Weinstein, Perjury (New York: Knopf, 1978), p. 353. ^ Weinstein, Perjury (1978), pp. 353–54. ^ "Hiss Identifies Yalta Notation". The New York Times. 1955. ^ Historian Fraser J. Harbutt recounts that at Dumbarton Oaks, "The consternation aroused by this Soviet demand (Stettinius recalled that it burst upon the British and Americans 'like a bombshell') is a telling illustration of the State Department's lack of imagination and foresight in this area." Harbutt points out that FDR had been present in April 1917 when pre-Lenin Russia brought up the same issue during negotiations for the League of Nations and argues that he and Stettinius ought to have anticipated and been prepared for it. See Fraser J. Harbutt, Yalta 1945: Europe and America at the Crossroads (Cambridge University Press, 2010) p. 261. ^ Details of the final Yalta agreements on spheres of influence, hammered out at Tehran (1943), Moscow Conference (1944), and earlier, were kept secret, even from Vice President Harry Truman. Instead, Roosevelt, aiming at getting domestic public opinion to support American internationalism and the establishment of the United Nations, chose to publicize the deceptively optimistic "Declaration on Liberated Europe," which pledged the three allies to establishing free elections and democratic governments, in accordance with the principles of the 1941 Atlantic Charter) in the nations they had liberated. See Harbutt. ^ a b Hiss, Alger (1990). Interviewed by James S. Sutterlin. "The Founding of the United Nations : an Interview with Alger Hiss by James S. Sutterlin". DAG Repository. United Nations. Retrieved August 7, 2017. ^ Weinstein, Perjury (1978), p. 361. ^ "The Ghosts on the Roof," Time, March 5, 1945, reprinted in Time, January 5, 1948. See also Whittaker Chambers, The Ghosts on the Roof, Selected Essays, edited by Terry Teachout, (Regnery, 1989, and Transaction Publishers, 1996). In his ironic editorial Chambers has the ghost of the Czar of Russia profess himself happy with Stalin because he has restored the pre-World War I borders of the Russian empire and abandoned revolutionary ideals for conservatism, while the Czarina accuses the Muse of History of reading the works of Leon Trotsky. ^ Doug Linder. "Testimony of Whittaker Chambers before the House Committee on Un-American Activities (August 3, 1948)". Law2.umkc.edu. Retrieved February 9, 2013. ^ See Tim Weiner, Enemies: A History of the FBI (Allen Weiner, 2012), p. 159. Being the agent of a foreign government, however repulsive, was only made illegal in 1938, with the passage of the Foreign Agents Registration Act. ^ William Fitzgibbon (June 12, 1949). "The Hiss-Chambers Case: A Chronology Since 1934". The New York Times. Retrieved May 2, 2014. ^ Bohdan S. Kordan, Canada and the Ukrainian Question, 1939-1945: A Study in Statecraft (Toronto: McGill-Queen's Press, 2001), p. 172. ^ "Wayback Machine". November 14, 2007. Archived from the original on November 14, 2007. Retrieved September 12, 2018. ^ Joseph B. Treaster (December 10, 1999). "Victor Perlo, 87, Economist For Communist Party in U.S." The New York Times. Retrieved May 2, 2014. ^ "Statement of Elizabeth Terrell Bentley (Silvermaster file, Vol. 6), p. 105 (PDF p. 106), November 30, 1945" (PDF). Archived from the original (PDF) on March 10, 2012. Retrieved February 9, 2013. ^ Gentry, Hoover the Man and the Secrets, p. 346. ^ Rick Perlstein writes, "When [Hiss] first testified it seemed to work.... He talked circles around his hapless interrogators. The committee, awed by Hiss, sat and took it while he lectured them. He finished to thunderclaps of applause. Rankin of Mississippi led a procession of witnesses to the table to apologize.... Supportive journalists confided to HUAC members that unless they ignored Chambers, their committee, already weakened by the Hollywood 10 circus of the previous year, was finished. The members were ready to pack it in and spend the rest of the summer back home. Only one member thought differently." Perlstein, Rick (2008). Nixonland: The Rise of a President and the Fracturing of America. Simon and Schuster. p. 30. ISBN 978-0-7432-4302-5. ^ Perlstein, Nixonland, p. 31. ^ Cronin was the main author of Communists Within the Labor Movement: A Handbook on the Facts and Countermeasures, published by the Chamber of Commerce in 1947. See John T. Donovan, Crusader in the Cold War: a Biography of Fr. John F. Cronin, S.S. (1908–1994) (Peter Lang Publishing, 2005), pp. 48, 88, and passim. In the 1950s, when Nixon was Vice President, Cronin worked for him as his adviser and chief speech writer. ^ "John F. Cronin, S.S., "The Problem of American Communism in 1945," p. 49 (PDF p. 58)" (PDF). Retrieved February 9, 2013. ^ Douglas Linder, "The Trials of Alger Hiss: An Account", Famous Trials (University of Missouri-Kansas City School of Law, 2003). ^ Whalen, Robert G. (December 12, 1948). "Hiss and Chambers: Strange Story of Two Men; The Drama Since 1934". The New York Times. Retrieved November 11, 2007. ^ Samuel Roth, a publisher of erotica who had accepted some of Chambers' poetry written under his own name, came forth with an affidavit that Chambers had also submitted poetry to him using the pen name of George Crosley. The Hiss defense decided not to use this information, however, because Roth had been prosecuted for obscenity. Chambers, also, admitted in secret testimony to the FBI that it was "entirely possible" that he had used the name Crosley during the time he knew Hiss. See William Howard Moore, Two Foolish Men: The True Story of the Friendship Between Alger Hiss and Whittaker Chambers, (Moorup, 1987), p. 32 and passim for an extended discussion of this issue, available in pdf form on the Alger Hiss Story Website. See also Anthony Summers, The Arrogance of Power: The Secret World of Richard Nixon (New York, London: Penguin-Putnam Inc, 2000), p. 490; and Gay Talese, Thy Neighbor's Wife, (New York: Harper Perennial Book, 2009) p. 102. ^ Hearing of August 17, 1948 Archived July 21, 2010, at the Wayback Machine Special Subcommittee of the Committee on Un-American Activities, U.S. House of Representatives. (Transcript at "The Alger Hiss Trials: An Account," Famous Trials, by Douglas Linder, University of Missouri-Kansas City School of Law.) Retrieved July 15, 2009. ^ See: United Press, "Robinson Case Leads to a Trail of Racketeers" and "Mrs. Robinson Reportedly Executed," Pittsburg Press, January 7, 1938, p. 1; and Associated Press, "Passport Mystery Baffles Probers: Case of Robinson-Rubens linked to racket," Reading Eagle, January 9, 1938, pages 1 & 16. ^ Scan of Hiss's January 28, 1938, handwritten note from website Documents Talk. ^ FBI report, quoted by Weinstein (1978), p. 247. ^ Sidney Zion, "The Hiss Case, a mystery ignored," New York Magazine, April 24, 1978, pp. 10–11. ^ Navasky, Victor (April 8, 1978). "The Case Not Proved Against Alger Hiss". The Nation. ^ a b c Cook, Fred J. (1958). The Unfinished Story of Alger Hiss. William Morrow Company. pp. 19: pp. 69–73: pp. 75–81 pp 155: pp. 126: pp. 147–151: pp. 156. ISBN 978-1-131-85352-9. ^ "Truman thought the anti-communist hearings were 'a red herring to keep people from doing what they ought to do. They are slandering people who don't deserve it.'" (David McCullough, Truman, [New York: Simon and Schuster], p. 652). Truman told oral biographer, Merle Miller, "What they were trying to do, all those birds," he said, "they were trying to get the Democrats. They were trying to get me out of the White House, and they would go to any lengths to do it.... They did do just about anything they could think of, all that witch hunting.... The constitution has never been in so much danger...." (quoted in Anthony Summers (2000), p. 65). Miller's accuracy in reporting Truman's statements has been questioned by some. ^ Halberstam, David. The Fifties, (New York: Random House, 1993), 16. Halberstam concludes that "Whether Hiss actually participated in espionage was never proved and the evidence was, at best, flawed" (14–25). ^ "The Alger Hiss Case — Central Intelligence Agency". July 11, 2007. Archived from the original on July 11, 2007. Retrieved September 12, 2018. ^ Summers, Anthony. The Arrogance of Power: The Secret World of Richard Nixon, (Penguin-Putnam Inc., 2000), pp. 73–77. ^ Summers (2000), p. 71. ^ Perlstein, Nixonland, p. 33. ^ United States v. Hiss , 185 F.2d 822 (2d Cir. 1950). ^ 340 U.S. 948 (1950). ^ White (2005), pp. 205–6. ^ Edwards, William (November 18, 1962). "How U.S. Probers Tripped Alger Hiss". Chicago Tribune. Retrieved November 26, 2016. ^ "Smith, Howard K." The Museum of Broadcast Communications. Archived from the original on February 2, 2009. Retrieved December 30, 2008. ^ Noe, Denise (2005). "The Alger Hiss Case; The Pumpkin Papers". Crime Library. Courtroom Television Network. Archived from the original on October 17, 2008. ^ Tom Goldstein (August 1, 1975). "U.S. Releases Copies of 'Pumpkin Papers'". The New York Times. Retrieved May 2, 2014. ^ Stone, Geoffrey; M. Wald, Patricia; Fried, Charles; Scheppele, Kim Lane (Winter 2006). "Constitutions Under Stress: International and Historical Perspectives" (PDF). Bulletin of the American Academy. ^ "Alger Hiss Dead at 92". Boston Globe. November 16, 1996. Retrieved March 17, 2008. Alger Hiss, the high-ranking State Department official accused of espionage whose case became one of the most celebrated—and controversial—in US history, died yesterday in Lenox Hill Hospital in New York City. He was 92. ^ Scott, Janny (November 16, 1996). "Alger Hiss, Divisive Icon of the Cold War, Dies at 92". The New York Times. Retrieved May 2, 2014. ^ Edward F. Ryan (April 9, 1952). "French in 1939 Called Hiss Red, Bullitt Says". The Washington Post. Retrieved May 2, 2014. ^ "Daladier Does Not Recollect Giving Bullitt a Report on Hiss". The Washington Post. April 10, 1952. Retrieved May 2, 2014. ^ According to Gilbert Gall, the FBI's 1950 report on Weyl states that he told the agency that when he participated in the Ware group, "Lee Pressman was present at about ninety percent of the meetings he attended, and that he has a fairly clear recollection of Alger Hiss being present at some of the meetings." See Gilbert J. Gall, Pursuing Justice: Lee Pressman, the New Deal, and the CIO (SUNY Press, 1999), p. 40. ^ Weyl, Nathaniel (1950). Treason: The Story of Disloyalty and Betrayal in American History. Public Affairs Press. ISBN 978-1-296-19279-2. ^ Weyl, Nathaniel (2003). Encounters With Communism. Xlibris Corporation. pp. 30–31, 114–118. ISBN 978-1-4134-0747-1. One thing that would have been discussed at these meetings was the New Deal's response to the plight of black tenant farm workers in Alabama. Weyl told reporter I. F. Stone that "nothing improper" had happened in the unit, but that he (Weyl) was so uncomfortable with Communist secrecy that he soon quit government to become a full-time organizer among agricultural workers. See J. J. Guttenplan, American Radical: The Life and Times of I. F. Stone (New York: Farrar, Straus and Giroux, 2009), p. 105. Stone, though convinced Hiss had been railroaded by Nixon, said he didn't know whether Hiss had ever been a Soviet agent. Another celebrated liberal reporter, A. J. Liebling, who struck up a warm friendship with Hiss while covering the trial, came to similar conclusions. See Raymond Sokolov's Wayward Reporter: the Life of A. J. Liebling (New York: Creative Arts Book Company, 1984) p. 207. ^ "Sleuth "Hired by Hiss" Touched Off Hunt for Typewriter Here". Philadelphia Evening Bulletin. December 14, 1948. hdl:2027/spo.hiss1111.0182.001. ^ After Hiss had been jailed, his lawyer Chester Lane received a tip that "'Schmahl was implicated with the typewriter.' An investigator who had worked with Schmahl, Harold Bretnall, subsequently told the lawyer that Schmahl had been involved in forging the Hiss typewriter. 'Hiss', Bretnall said, 'was framed.' Schmahl, tracked down in 1973, admitted to a Hiss investigator he had been a 'consultant' on the typewriter forgery. He said the OSS had set Hiss up—just when was not clear—and the orders had come from through [OSS Director] Donovan's law firm, Donovan, Leisure. Schmahl later retracted his statements and declined further interviews." (Summers (2000), p. 73). ^ Squier, Michael. "Typewriter Evidence; Alger Hiss' appeal in court may depend on the credibility of a mute witness. ", The New York Times, February 3, 1952. Retrieved September 12, 2008. ^ John Lowenthal (June 26, 1976). "What the FBI knew and hid". The Nation. Retrieved July 12, 2010. ^ Alger Hiss (1957). In the Court of Public Opinion. Alfred Knopf. pp. 363–409. ^ Alger Hiss (1957). In the Court of Public Opinion. Alfred Knopf. p. 401. ^ Allen Weinstein disparages such ideas at some length as far-fetched "conspiracy theories," calling them "inconsistent and contradictory" (Perjury [Vintage Books, 1979] p. 575 and passim). ^ Lowenthal, John (June 26, 1976). "What the FBI Knew But Hid from Hiss and the Court". The Nation. Retrieved August 13, 2007. Bradford, Russell R.; Bradford, Ralph B. (1992). "A History of Forgery by Typewriter". An Introduction to Handwriting Examination and Identification. ^ "Horace W. Schmahl". The Alger Hiss Story. Retrieved April 10, 2007. ^ Cook, Fred J. (October 11, 1980). "Alger Hiss — A Whole New Ball Game". The Nation. ^ Stephen W. Salant (2010). "Successful Strategic Deception: A Case Study". Retrieved July 12, 2010. ^ During the War, Schmahl graduated from the Military Intelligence Training Center. See: Graduates of Twenty-First Class (Report). 2010. hdl:2027/spo.hiss1111.0216.001. He became a Special Agent in the Counter Intelligence Corps. See: Summary of St. Louis Personnel Record (Report). 2010. hdl:2027/spo.hiss1111.0144.002. See also: FBI Memorandum re Horace Schmahl (Report). 2010. hdl:2027/spo.hiss1111.0161.002. ^ For a class lecture on forgery, typewriting, and alteration of documents, see: Lieutenant Thompson (1942). Handout on Questioned Documents (Handwriting, Typewriting) (Report). hdl:2027/spo.hiss1111.0222.001. For a textbook clarifying counterintelligence techniques taught at the time of the first Hiss trial, see: Counter Intelligence Corps Investigator. June 1949. hdl:2027/spo.hiss1111.0224.001. ^ For the official rationale for such domestic activities despite delimitation agreements with the FBI, see the official history: CIC in the Zone of the Interior. 1942. hdl:2027/spo.hiss1111.0220.001. especially p. 1093. For an academic historian's assessment of these violations, see: Joan Jensen (July 12, 2010). "World War II: Expanding the Boundaries". Army Surveillance in America, 1775–1980. hdl:2027/spo.hiss1111.0208.001. especially p. 219. For the accounts of special agents surveiling civilians suspected of (1) aiding communists, see: Special Agent Duval Edwards (1994). Spy Catchers of the U.S. Army. Red Apple Publishing. especially p. 88; (2) aiding Nazis, see: Anthony Karge (2009). "Memorial Day parade grand marshal returns to service". Westport News. hdl:2027/spo.hiss1111.0234.001. ; and (3) aiding all political shades in between, see: Isadore Zack (July 12, 2010). "Isadore Zack-CIC Collection at the Milne Special Collection, University of New Hampshire Library". Retrieved July 12, 2010. ^ Franklin Victor Reno arrived on the Army base on July 26, 1937, and aroused enough suspicion that by August 5, the Army put him under surveillance. See: Franklin Victor Reno, 1937 investigation and incomplete IRR file (Report). July 12, 2010. hdl:2027/spo.hiss1111.0221.001. ^ For one agent's account of working undercover at the San Francisco conference and photos of fellow agents there, see: Leonard L. (Igor) Gorin (Winter 2004–2005). "United Nations Formation 1945—CIC Security Role". Golden Sphinx (Serial Issue #2004–3): 16–20. hdl:2027/spo.hiss1111.0206.001. ^ Dean, John (1976). Blind Ambition: The White House Years. Simon & Schuster. ISBN 978-0-671-22438-7. ^ Summers, Anthony (2000). The Arrogance of Power: The Secret World of Richard Nixon. Penguin-Putnam Inc. p. 73. ISBN 978-0-670-87151-3. ^ See Barry Werth, 31 Days: The Crisis That Gave Us the Government We Have Today (New York: Nan Talese, 2006), pp. 84–87; and Stanley I Kutler, Abuse of Power: The New Nixon Tapes (New York: Touchstone, 1998), pp. 338–39, where Nixon says: "Don't worry about his trial.... Just get everything out. Try him in the press. Try him in the press ... leak it out. We want to destroy him in the press. Press. Is that clear.... I want somebody to take it just like I took the Hiss case"
^ In the decades that followed Schmahl and his associates were to be linked to the CIA and with Richard Nixon (Summers (2000), p. 491). ^ Allen Weinstein, Perjury (1978), p. 578. ^ Field lacked confidence he could stand up under testimony: "Alger defended himself ... with great intelligence. He had been trained as a lawyer and knew all the phrases and tricks. I, on the other hand, had no such experience.... I did not trust myself to stand before my accusers and shout 'innocent' in their faces.... I also understood the same from a short letter from Hiss, who obviously could not write openly," he stated. Sam Tanenhaus, Hiss Case 'Smoking Gun'?, The New York Times, Oct. 15, 1993. ^ James Srodes, Allen Dulles: Master of Spies (Regnery, 2000), p. 412. ^ It has been suggested that Field was a victim of a disinformation campaign by Allen Dulles called "Operation Splinter Factor", see William Blum, Killing Hope: US Military and CIA Interventions Since World War II (London: Zed Books, 2003) p. 58, and even the inspiration for John le Carré's thriller, The Spy Who Came In From the Cold, but the CIA disputes these theories. See Stephen Dorril, MI6: Inside the Covert World of Her Majesty's Secret Intelligence Service (Simon and Schuster, 2002), p. 484. The narrator in Norman Mailer's fictional chronicle about the CIA, Harlot's Ghost, refers to Noel Field as "the American Martyr". ^ The Alger Hiss Story: The Cast: Hede Massing. For more on the dinner party story from newly available Soviet and Hungarian documents see the website, Documents Talk, maintained by Svetlana Chervonnaya. ^ a b Tanenhaus, Sam (April 1993). "Hiss: guilty as charged". Commentary. V. 95. ^ Klingsberg, Ethan (November 8, 1993). "Case Closed on Alger Hiss?". The Nation. ^ Douglas Martin (February 11, 2002). "Robert J. Lamphere, 83, Spy Chaser for the F.B.I., Dies". The New York Times. Retrieved May 2, 2014. ^ a b "Venona transcript #1822, with commentary by Douglas Linder". The Trials of Alger Hiss: A Commentary. Archived from the original on June 19, 2006. ^ "Appendix A; SECRECY; A Brief Account of the American Experience" (PDF). Report Of The Commission On Protecting And Reducing Government Secrecy. United States Government Printing Office. 1997. pp. A–37. Archived from the original (PDF) on June 29, 2007. ^ Moynihan, Daniel Patrick (1998). Secrecy: The American Experience. Yale University Press. p. 146. ISBN 978-0-300-08079-7. ^ a b Haynes, John Earl; Klehr, Harvey (2000). Venona: Decoding Soviet Espionage in America. Yale University Press. pp. 170: pp. 36. ISBN 978-0-300-08462-7. For an assessment of Haynes and Klehr's perspective on the role of the American Communist Party in the 1930s, see James T. Patterson, "The Enemy Within", The Atlantic Monthly (October 1998). ^ "Secrets, Lies and Atomic Spies; Alger Hiss". Nova Online. 2002. ^ Linder, Doug (2003). "The Venona Files and the Alger Hiss Case". 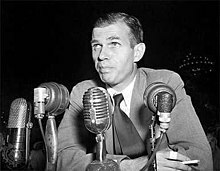 Famous Trials: The Alger Hiss Trials - 1949–50. Archived from the original on August 30, 2006. Retrieved September 13, 2006. ^ default (March 30, 1945). "Alger Hiss and the VENONA files". Law.umkc.edu. Archived from the original on June 19, 2006. Retrieved February 15, 2014. ^ Lowenthal, David (May 2005). "Did Allen Weinstein Get the Alger Hiss Story Wrong?". History News Network. Retrieved September 13, 2006. ^ Also spelled "Vyshinskii", "Vishinsky" and "Vyshinski". ^ Mark, Eduard (September 2003). "Who was 'Venona's' 'ALES'? cryptanalysis and the Hiss case". Intelligence and National Security. 18 (3): 45–72. doi:10.1080/02684520412331306920. A Cold War hardliner, Mark also maintained that Venona proved that Roosevelt's close adviser, Harry Hopkins, originator of The New Deal, was a Soviet agent. See also Mark's previous (1998) article in the same periodical: "Venona's Source 19 and the Trident Conference of May 1943: Diplomacy or Espionage?" Intelligence and National Security: 13: 2 (April 1998): 1–31. ^ Schindler, John R. (October 27, 2005). "Hiss in VENONA: The Continuing Controversy". Center for Cryptologic History Symposium. ^ Haynes, John Earl; Klehr, Harvey (2003). In Denial: Historians, Communism, and Espionage. Encounter Books. pp. 158–163. ISBN 978-1-893554-72-6. ^ Bird, Kai; Chervonnaya, Svetlana (Summer 2007). "The Mystery of Ales". American Scholar. Retrieved September 12, 2009. ^ Haynes, John Earl; Klehr, Harvey (April 16, 2007). "Hiss Was Guilty". History News Network. ^ Haynes, John Earl (April 14, 2007). "Ales: Hiss, Foote, Stettinius?". ^ Mark, Eduard (Summer 2009). "In Re Alger Hiss: A Final Verdict from the Archives of the KGB". Journal of Cold War Studies. 11 (3): 50. doi:10.1162/jcws.2009.11.3.26. ^ Andrew, Christopher; Gordievsky, Oleg (1990). KGB: The Inside Story of Its Foreign Operations from Lenin to Gorbachev. Harpercollins. p. 287. ISBN 978-0-06-016605-2. ^ "The New York Review of Books: NOT A RECRUITER". The New York Review of Books. March 24, 2004. Archived from the original on March 24, 2004. Retrieved September 12, 2018. ^ "LEADING ARTICLE : Michael Foot's tainted accuser". The Independent. February 20, 1995. Kobyakov, Julius N. (October 16, 2003). "Alger Hiss". H-Diplo. Humanities and Social Services Net. Retrieved October 25, 2007. ^ Pyle, Richard (April 5, 2007). "Researcher adds to Alger Hiss debate". The Washington Post. Associated Press. ^ Haynes, John Earl; Harvey Klehr; Alexander Vassiliev (2010). Spies: The Rise and Fall of the KGB in America. Yale University Press. ISBN 978-0-300-16438-1. ^ "In Re Alger Hiss: A Final Verdict from the Archives of the KGB", in Journal of Cold War Studies (Summer 2009): 11:No. 3: 26–67. ^ Kisseloff, Jeff. "Kisseloff, Jeff, "'Spies': Fact or Fiction? ", The Alger Hiss Story (2009)". Homepages.nyu.edu. Retrieved February 9, 2013. ^ Amy Knight, "Leonard? ", Times Literary Supplement (June 26, 2009). Haynes responded to Knight on his website. ^ a b c d Guttenplan, Red Harvest. ^ Kisseloff, "Spies: Fact or Fiction" (2009). ^ "Just a year after the collapse of the Soviet Union, the intelligence services responded to an offer from Crown Publishers, which offered a substantial payment to a pension fund for its retired officers in return for cooperation on a series of books on Soviet intelligence. As part of the agreement the SVR gave Alexander Vassiliev permission to examine archival records for a book project that teamed a Russian (Vassiliev) and an American (Allen Weinstein) for a book on Soviet espionage in the 1930s and 40s", Haynes, Klehr, and Vassiliev (2009), p. xxii. ^ Judge Eady also issued a separate opinion in which he stated that the book by Haynes, et al., by asserting that the Hiss case was definitively "settled", had in effect "thrown down a gauntlet" to any would-be defender of Hiss; and that family, friends, or any other defender of Hiss should not be penalized for "picking up that gauntlet". ^ Charles Arthur, "Former KGB Agent Sues Amazon Over Book Review" The Independent, UK (May 3, 2003). ^ Jon Wiener, "Allen Weinstein, Historian With a History", Los Angeles Times, May 2, 2004, reprinted in the HNN. ^ See "Costly Error for Hiss Historian: Weinstein Pays for Mistake", New York Magazine (May 21, 1979), 61. For more on Weinstein, see also Jon Wiener, "Alger Hiss, the Archives, and Allen Weinstein", pp. 31–57, Chapter Two, in Historians in Trouble: Plagiarism, Fraud, and Politics in the Ivory Tower (New York: New Press, 2004, ISBN 978-1565848849 (Paperback 2007). Brady, Joan (2015). America's Dreyfus: The Case Nixon Rigged. London, UK: Skyscraper Publications. Chambers, Whittaker (1952). Witness. Random House. ISBN 978-0-89526-571-5. Cook, Fred J (1957). The Unfinished Story of Alger Hiss. New York: William Morrow. Cooke, Alistair (1950). A Generation on Trial: USA v. Alger Hiss. Greenwood Press. ISBN 978-0-313-23373-9. Gentry, Curt. J. Edgar Hoover: The Man and The Secrets. New York: W. W. Norton, 1991. Hartshorn, Lewis. Alger Hiss, Whittaker Chambers and the Case That Ignited McCarthyism. Jefferson, North Carolina: McFarland, 2013. Haynes, John Earl; Klehr, Harvey; Vassiliev, Alexander (2009). Spies: The Rise and Fall of the KGB in America. New Haven: Yale University Press. ISBN 978-0-300-12390-6. Hiss, Alger (1957). In the Court of Public Opinion. Harper Collins. ISBN 978-0-06-090293-3. Hiss, Alger (1988). Recollections of a Life. Little Brown & Co. ISBN 978-1-55970-024-5. Hiss, Tony (1999). The View from Alger's Window: A Son's Memoir. Alfred E. Knopf. ISBN 978-0-375-40127-5. Jacoby, Susan (2009). Alger Hiss and the Battle for History. New Haven: Yale University Press. Jowitt, William (The Earl Jowitt) (1953). The Strange Case of Alger Hiss. Hodder and Stoughton. Levitt, Morton and Michael Levitt (1979). A Tissue Of Lies: Nixon Vs. Hiss. New York: McGraw Hill. Lowenthal, David. "Academic Freedom: The Hiss Case Yields a Noteworthy Victory". American Historical Association Perspectives (May 2004): 23–26. Smith, John Chalbot (1976). Alger Hiss: The True Story. New York, Holt Rinehart Winston. Summers, Anthony (2000). The Arrogance of Power: The Secret World of Richard Nixon. Penguin-Putnam Inc. ISBN 0-670-87151-6. Tanenhaus, Sam (1998). Whittaker Chambers: A Biography. Modern Library. ISBN 978-0-375-75145-5. Weinstein, Allen (1997). Perjury: The Hiss-Chambers Case (2d rev. ed.). Knopf. ISBN 978-0-394-49546-0. Weinstein, Allen; Vassiliev, Alexander (1999). The Haunted Wood: Soviet Espionage in America—The Stalin Era. Modern Library. ISBN 978-0-375-75536-1. White, G. Edward (2005). Alger Hiss's Looking-Glass Wars: The Covert Life of a Soviet Spy. Oxford University Press. ISBN 978-0-19-518255-2. Kai Bird and Svetlana Chervonnaya, "The Mystery of Ales (expanded version)", The American Scholar, Summer 2007. Chervonnaya, Svetlana. Letting Documents Talk: A Non-Definitive History. Website about documents from formerly secret Soviet and other Eastern and Central European archives relating to the Hiss controversy. Gay, James Thomas (1998). "The Alger Hiss Spy Case". HistoryNet.com. Retrieved September 13, 2006. Hermann, Donald H. J. (2005). "Deception And Betrayal: The Tragedy Of Alger Hiss". The Chicago Literary Club. Archived from the original on June 14, 2006. Kisseloff, Jeff (Managing Editor) (2003). "The Alger Hiss Story; Search for the Truth". Archived from the original on September 5, 2006. Retrieved September 13, 2006. Levin, David (1976). "In the Court of Historical Criticism: Alger Hiss's Narrative", Virginia Quarterly Review Online, Winter, 1976, 41pp.–71. Levin, David (1978). "Perjury, History, and Unreliable Witnesses", Virginia Quarterly Review Online, Autumn, 1978, pp. 725–32. Linder, Douglas (2003). "The Alger Hiss Trials: An Account". Famous Trials. University Of Missouri-Kansas City School Of Law. Archived from the original on August 30, 2006. Lowenthal, John (Autumn 2000). "Venona and Alger Hiss" (PDF). Intelligence and National Security. Archived (PDF) from the original on September 9, 2006. Retrieved September 13, 2006. Moynihan, Daniel Patrick (Chairman) (1997). "Report of the Commission On Protecting And Reducing Government Secrecy" (PDF). United States Government Printing Office. Archived from the original (PDF) on May 4, 2011. Retrieved September 13, 2006. Navasky, Victor (1997). "Allen Weinstein's Docudrama". The Nation. Archived from the original on June 27, 2003. A review of Weinstein's "Perjury"
Noe, Denise (2005). "The Alger Hiss Case". Crime Library. Courtroom Television Network. Archived from the original on September 25, 2008. Salant, Stephen W. (2010). "Successful Strategic Deception: A Case Study". Retrieved July 12, 2010. Scott, Janny (November 16, 1996). "Alger Hiss, Divisive Icon of the Cold War, Dies at 92". The New York Times. Schrecker, Ellen (December 14, 2009). Review of John Earl Haynes, Harvey Klehr, and Alexander Vassiliev's Spies: The Rise and Fall of the KGB in America. Diplo Roundtable Review: XI: 9 (December 14, 2009): 22–25. Schrecker, Ellen (May 24, 1999). "The Spies Who Loved Us? Book review of Weinstein and Vassiliev's The Haunted Wood". The Nation. Discusses "unique context" of 1930s and 1940s espionage. Sunstein, Cass R. (October 29, 2013). "How the Alger Hiss Case Explains the Tea Party". Bloomberg News. Vassiliev, Alexander. "Black Notebook [Translated]" (PDF). Archived from the original (PDF) on July 11, 2010. Retrieved August 31, 2009. Vassiliev, Alexander. "White Notebook #3 [Translated]" (PDF). Archived from the original (PDF) on July 11, 2010. Retrieved August 31, 2009. Vassiliev, Alexander. "Yellow Notebook #2 [Translated]" (PDF). Archived from the original (PDF) on July 11, 2010. Retrieved August 31, 2009. Wikimedia Commons has media related to Alger Hiss.